The IEEE is a non-profit organization and is the world's leading professional association for the advancement of technology. The full name of the IEEE is the Institute of Electrical and Electronics Engineers, Inc., although the organization is referred to by the letters I-E-E-E and pronounced Eye-triple-E. Through its global membership, the IEEE is a leading authority on areas ranging from aerospace systems, computers and telecommunications to biomedical engineering, electric power and consumer electronics among others. Members rely on the IEEE as a source of technical and professional information, resources and services. To foster an interest in the engineering profession, the IEEE also serves student members in colleges and universities around the world. Other important constituencies include prospective members and organizations that purchase IEEE products and participate in conferences or other IEEE programs. More than 370,000 members, including more than 80,000 students, in over 160 countries. 319 sections in ten geographic regions worldwide. 1676 chapters that unite local members with similar technical interests. More than 1,526 student branches at colleges and universities in 80 countries. 39 societies and 5 technical councils representing the wide range of technical interests. 132 transactions, journals and magazines. More than 450 IEEE sponsored or cosponsored conferences worldwide each year. Over 900 active IEEE standards and more than 400 in development. 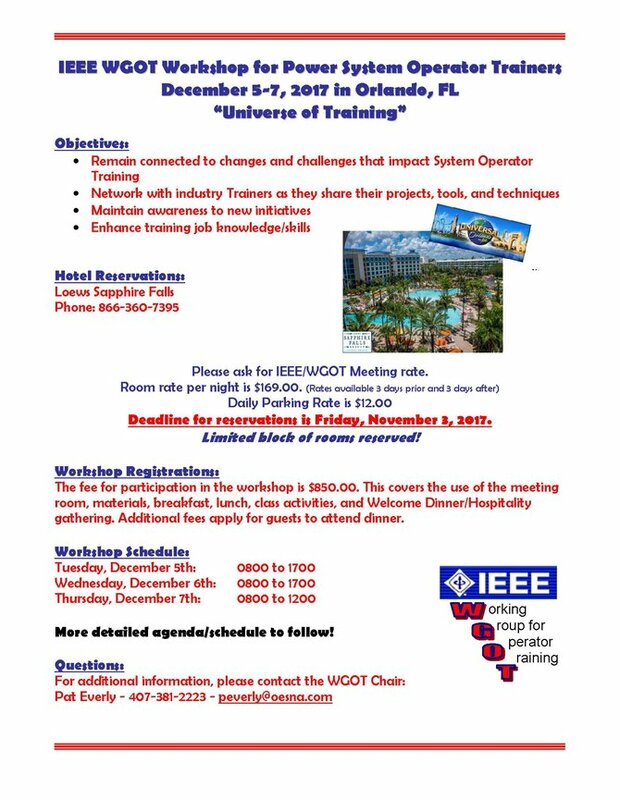 The Working Group for System Operator Trainers falls under the scope of the IEEE Power System Operations Committee (PSOC). The WGOT was formed several years ago to provide a venue for System Operator Trainers, Coordinators, Managers or any other person who had a vested interest in training System Operators. The WGOT holds annual workshops at various locations around North America to foster the training effort for System Operators throughout the industry. Through the expertise of industry training professionals, the WGOT Workshops provide a wealth of knowledge and techniques that can be utilized in the daily training challenges for System Operators. In addition, the workshops provide a network of training professional for future reference.